Review: The landscape of Mexican dining in Lafayette has really grown in the past few years, and I was told I simply must try out Taco Rico. I don’t need much pressure to test out a new Mexican place, so off we went. Saturday for lunch was very crowded! I couldn’t believe how many people were out to lunch at a strip mall Mexican place. We found a seat and were greeted with menus and drink orders, chips and salsa almost immediately. I’m a sucker for fresh chips and salsa. They were nothing spectacular (I really prefer a chunkier salsa) but pretty tasty. We placed our orders and waited for our meal to arrive. It was so busy, that it did take some extra time to get our food, but it was certainly very tasty. My chicken fajitas were so pretty I almost didn’t want to eat them. Almost. Usually you see a pile of chicken with some onions, maybe a slice of pepper or two. This steaming plate was piled high with tons of onions and peppers (even red ones!) as well as chicken. 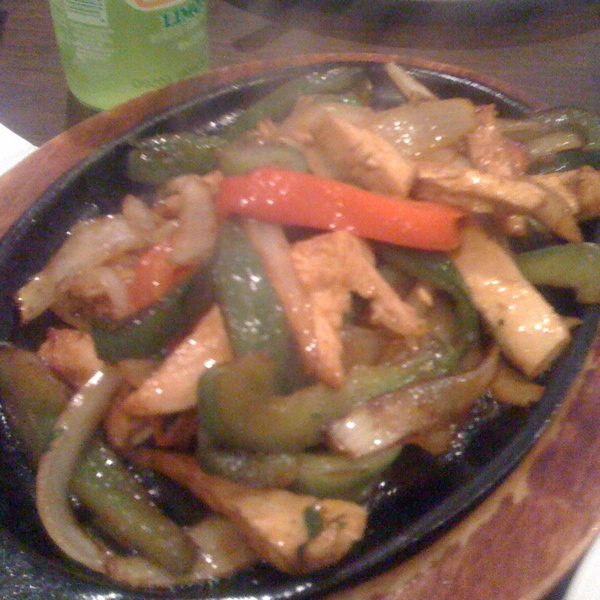 The fajita meat and veggies were fantastic. It was served with beans, rice and guacamole, but no lettuce, cheese, or sour cream. I’m not sure if that’s how it comes there, or if it was just an oversight. Either way, I did enjoy my meal. The service was pretty good. I really liked that the servers all wore uniforms. You just really don’t see that anymore in restaurants, and I really thought it was a nice touch. The uniforms consisted of black pants with bright pink blouses with Taco Rico on the pocket area. It made it easy to find your server, and added a little class to the restaurant. It’s a small restaurant, nothing fancy, but good food with a nice atmosphere. I know I’ll go again. Kid Friendly: Yes, the kids’ menu included chicken tenders and hot dogs.